As a HubSpot partner, it is important to reach your clients nearing their renewal dates. 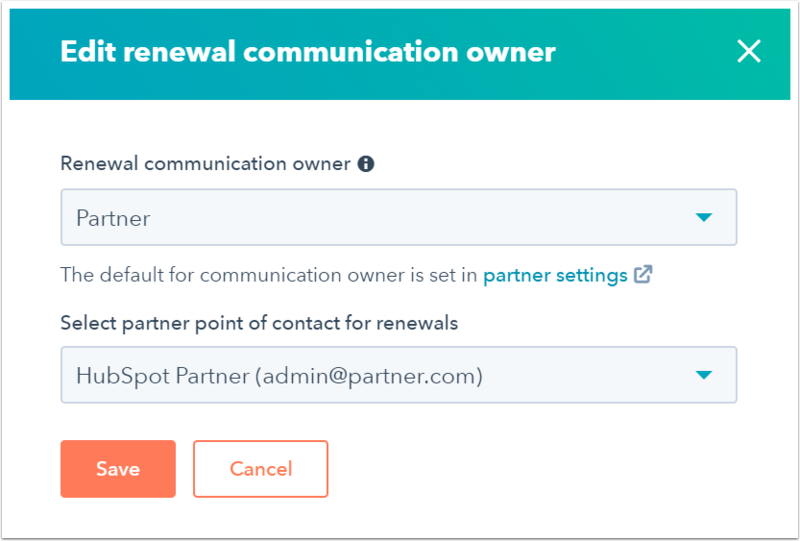 You can decide to let HubSpot send renewal notices directly to your clients or own the renewal process yourself. Set default renewal owner for all clients. Set the default renewal communications owner for all clients. 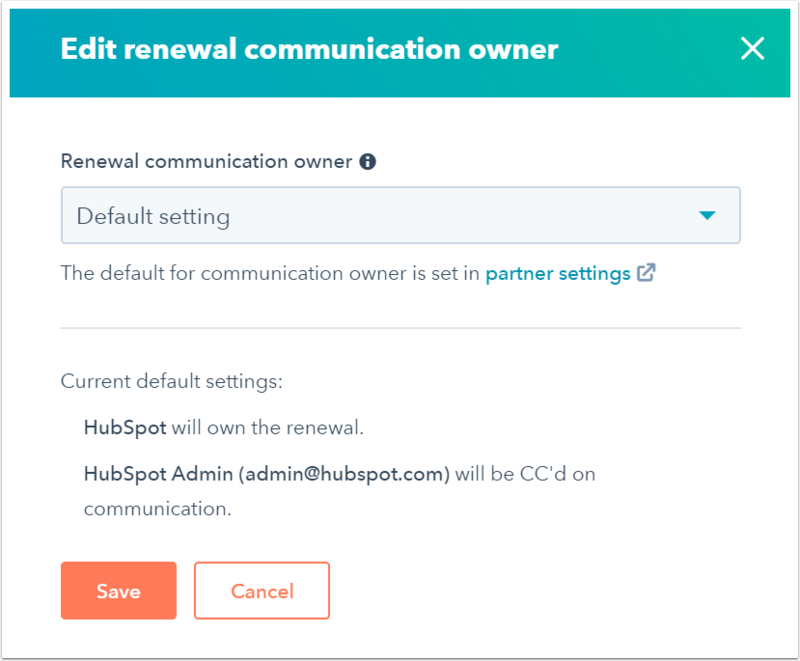 HubSpot: HubSpot will be the default renewal communication owner for all clients. All notices and reminders relating to client accounts will be sent to the client's decision maker, copying your point of contact. Partner: You will be the default renewal communication owner for all clients. All notices/reminders relating to client accounts will only be sent to your point of contact. Click the Select partner user to be notified dropdown menu and select your point of contact. This will be the user who will either be copied in HubSpot communications to your clients, or receive the notifications on client accounts. These steps override the default setting above and works on a per client basis. Hover over the client to update and click the Actions dropdown menu beside the client website, then select Edit renewal owner. In the dialog box, click the Renewal communication owner dropdown menu to select an option. Default setting: the renewal owner will be as per the default setting. The details will be stated under Current default settings. HubSpot: all notices and reminders of any upcoming renewals will be sent directly to your client's decision maker. Click the Select partner user to be notified dropdown menu to select the user to be copied in these notices and reminders. Please note: the decision maker is based on the user selected in your client's portal. To see the decision maker, click the account name in the top right corner of your client's portal, then click Account & Billing. In the left sidebar menu, navigate to Company & Contacts and in the Contact Information section, you'll see the Decision Maker. Partner: all notices and reminders of any upcoming renewals will be sent directly to the partner point of contact for his action. 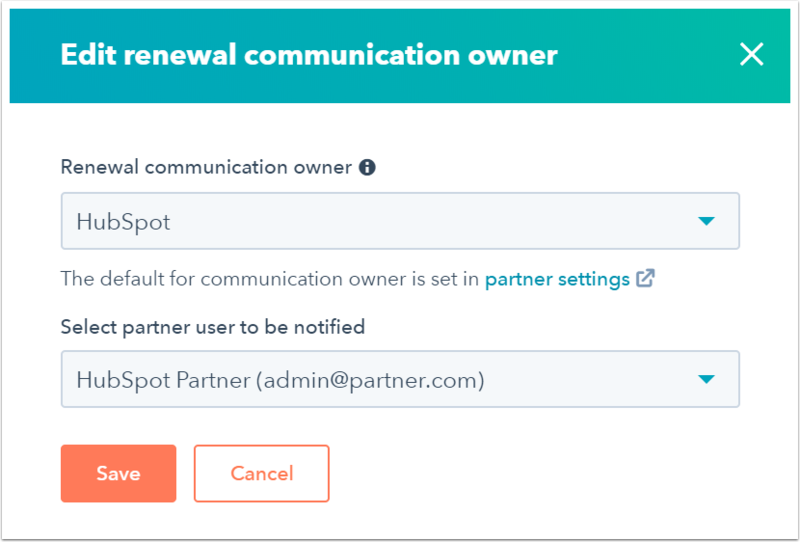 Click the Select partner point of contact for renewals dropdown menu to select the user who will be the point of contact for the client.